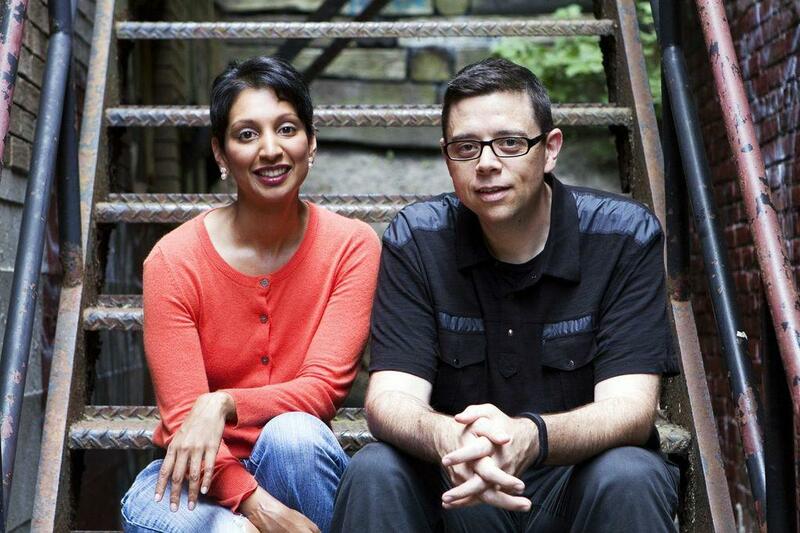 Medill alumna Gita Pullapilly and her husband Aron Gaudet have shifted from documentary filmmaking to writing and directing fiction with their newest project, “Beneath the Harvest Sky.” The film screened April 18 at the Tribeca Film Festival. Gita Pullapilly (Medill ’01) laughs as she remembers the rough cuts she made in her first editing class. The mistakes are far behind the filmmaker, whose latest project screened April 18 at the Tribeca Film Festival. Pullapilly and her husband, Aron Gaudet, are part of a small niche of moviemakers who shift between documentary and narrative fiction films. The film, which hits limited theaters in May and is available for digital download, tells the coming-of-age story of two boys, Casper and Dominic, in a small farm town. The pair plans to leave the town behind in hopes of finding a better life in Boston, but their dream is threatened when Casper (Emory Cohen) gets caught up in his father’s drug smuggling and his girlfriend gets pregnant. Critics praised the couple’s departure from documentary work to fictional narrative for its authenticity. For Pullapilly, the greatest challenge in creating a fictional film was managing a much larger crew. In the past, Pullapilly and her husband had made films with each other and maybe one other person, she said. For “Beneath the Harvest Sky,” she said they adapted to leading a 50- to 70-person crew. But despite initial “growing pains,” Pullapilly said her documentary background was an asset. She said her ability to help the actors develop real, believable characters and express emotional dimensions came from her roots in journalism. She and Gaudet met when they were working for television news stations in Grand Rapids, Michigan. Chicago resident Zoe Levin plays Tasha, Casper’s girlfriend who gets pregnant right as the pair is set to leave town. She said Pullapilly’s female perspective helped her develop her character more. Timm Sharp, who plays Casper’s uncle Badger, said the highlight of working with Pullapilly and Gaudet was how welcoming the pair was to his ideas. Sharp brought his dog to the filming location and later realized having the dog appear in the film with him would add an extra dimension to his character. Pullapilly loved it, he said. The pair’s decision to film on location in Aroostook County, Maine, also contributed to the production’s authenticity. The whole cast and crew lived in the small town for about a month while shooting. Cohen even arrived a few weeks early to completely immerse himself in the town’s culture and lived with the young adults he was attempting to portray, Sharp said. Levin said the unique living situation made her feel like the cast and crew were a family and helped her immerse herself in the film. But for Pullapilly, critics’ praise of the authenticity have been the “biggest compliment.” She said she really learned how to tell a story about social issues without hitting an audience over the head from the same professor who had to wade through her first rough edits for journalism class, Larry Stuelpnagel. Correction: A previous version of this story incorrectly stated the filming location. “Beneath the Harvest Sky” was taped on location in Aroostook County, Maine. The Daily regrets the error.